2 Dairy Milk chocolate of 13 gm each. The glass vase is a wonderful home décor piece. The green filler in the glass vase will depend on its regional availability. There are almost hundred species of roses in terms of color, shape and climatic conditions. 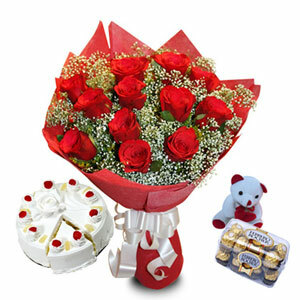 Celebrate your precious bonds with your loved ones this upcoming special occasion with this amazing gift hamper. 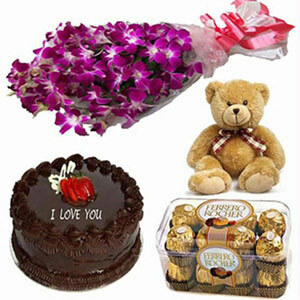 Comprising of pink roses in a glass vase, Celebrations chocolate box, and a comfy teddy bear is an incredible gift idea to stun your special ones.